It’s easy to get stuck in your own version of “Groundhog Day” – reliving the same mistakes over and over and over again. You make a promise to yourself and to God you will change your ways. You resolve with the new morning to be a different man. And you find yourself falling victim to the same temptations and struggles each day. Yet time after time, mistake after mistake, God forgives us. In a way, this kind of makes God look a little foolish. I mean, God gives away all this grace and forgiveness for free. You can basically get away with anything and have your slate wiped clean for free. It’s like God turns the other way and lets us get away with our repeated failures – a “Groundhog Day” of His people returning for grace. Is God the fool here? It seems like we’re pulling a fast one on Him by grabbing handfuls of His grace. But if we think God is the fool, we are missing the point of his forgiveness. God is not the fool constantly looking the other way as we sin against Him. He is the guide patiently pointing us in the right direction, waiting for us to make the right choice and break free from our endless cycle of mistakes. God is waiting for us to move on. When we feel like we’re taking advantage of God and His abundant offer of grace, it means we’re probably not actually taking advantage of all His grace offers. If you feel like you’re using God’s forgiveness as a chance to relive your very own “Groundhog Day”, it’s time to make a change. Instead of using all the chances God offers you as opportunities to make all the same mistakes, use the opportunity as a way to try and make things right. 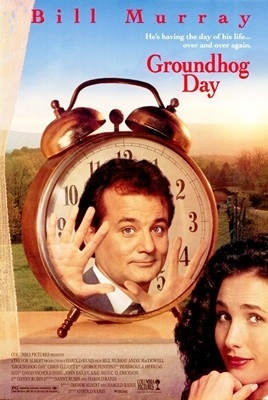 Do you ever get stuck in the “Groundhog Day” cycle? How can you move on?